The Satirical Christian: The Elf did it! "Don't blame us - it was the Elf!" they cried from behind closed doors. "The bombs of the Blitz couldn't stop us - the fires that raged could not close us down for long - but that Elf - he's the one to blame. The guy ropes are trip hazards and access is impaired - and those troublesome middle-aged idealists might block the way for ambulances and fire engines. The Elf of Safety gave us no choice! It's all his fault!" And so God looked at the Elf with troubled eyes - eyes that wanted answers - eyes that searched for truth amidst all the misdirection of press releases, briefings and spin. "Don't blame me!" said the Elf of Safety. " I was only doing my job. You can't be too careful these days." Then he paused for a moment before turning back with steely eyes. "Anyway - it wasn't me! I was that Goblin! He's the real reason your House closed its doors. The Goblin of Greed gets everywhere - tempting with the lure of yet more. He's the one who is to blame. He's in the offices and on the trading floors - he's at the gift shop and the Cathedral Door. He's in the suits and dinners and old school ties. He works by offering more and more - then follows it up with a dose of fear - the fear of losing out - the fear of losing friends - the fear of getting left behind - you have to keep up with the Jones's you know! He's the one to blame." And so God looked at the goblin with anger in his eyes - eyes that wanted answers - eyes that burned with rage. "Well you can't blame me!" The goblin put his case. "I didn't force anyone to do anything. I only showed them what's already there. What's just out of reach - but not for long. With the right contacts, the right attitude, the right system, the right drive and determination - what's out of reach today can be yours tomorrow - if you only want it badly enough. And once you've got it, don't let go. You don't want to have to down-size, do you? You don't want to fall behind the pack. "But anyway," he continued. " I can't be to blame, because according to all the important people, I don't exist! I am merely a inherent necessity for the wheels of prosperity to turn. I am but a figment of your imagination. Bankers, Directors, and Boards are not greedy - they simply get what they deserve. And if that's more than others - so what? After all we all need something to aim for. "If you ask me, those protesters are to blame. They are the ones who are rocking the boat. They are the ones who are making people feel uncomfortable by their outrageous demands. Equality and justice; sharing rather than acquiring; giving rather than getting; radical ideas, upsetting the status quo. They are the ones who are to blame." 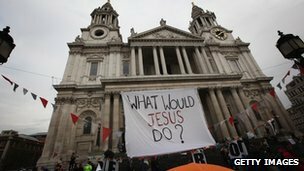 And so God looked at the protesters with sadness in his eyes. Because when he looked at them he saw a reflection of someone very close to him. Someone who gave up global comforts to live in local poverty. Someone who talked of sharing and giving; who knew what it felt like to be thrown out of places of worship and accused of blasphemy; someone who was humoured, then rejected by the people of power. Someone who had no-where to lay his head, and who camped out in public places. And someone who finally overstepped the mark when he took direct action against the money dealers and traders of his day, before paying the final price a week later for his naive, idealistic teaching, and his refusal to compromise. Since writing this blog, things have not ended well for the Dean of St Paul's who has resigned this afternoon. This is a cause for sadness - not rejoicing. He resinged after doing what he thought he was supposed to do - to protect the institution which had been enstrusted to him. But perhaps the institution is not what is most important. Perhaps it is people and the teachings of Christ which need to shine like a beacon in our world rather than buildings, however beautiful they may be. What a sad episode for the CoE in that it has been a missed opportunity to spread the gospel message. These windows of opportunity do not come around often. I have blogged about the same issue. Thank you for commenting Chelliah.